This multi-part hard plastic kit contains all you need to assemble 20 Sisters of Talliareum® Infantry. The sprues include all pieces required to assemble your forces with multiple ways. The detailed components include various arm/weapon types for customization purposes and along with the 4 different bodies, various front and rear tabards, shields, 4 different pauldron sets and multiple head variations (both helmeted and unhelmeted versions to choose from!) 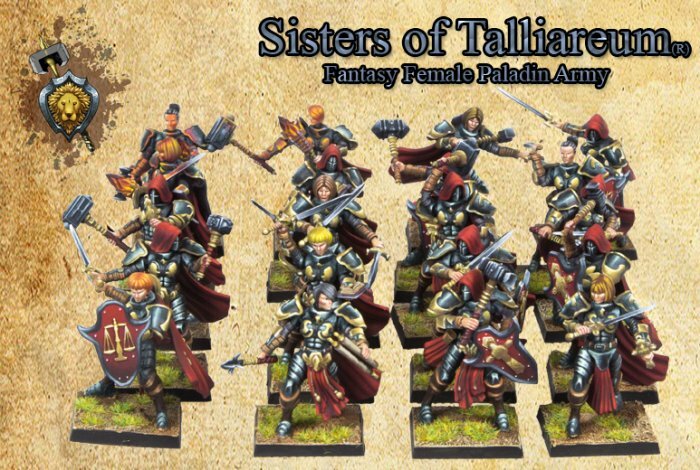 allows the creation of unique regiments for your disciplined Sisters of Talliareum® army. Models are supplied with twenty plastic 25mm square bases.